In October we provided a legislative recap of new laws for 2019. in December we addressed the federal and state regulatory environment. The judiciary ruled on a broad range of topics from leave interference and retaliation standards, to evidentiary standards for defenses to harassment claims, to interpretations of statutory requirements under FEHA, Labor Code, and Safety Officers’ Procedural Rights, the judiciary was very active in 2018. This webinar covers the substantive scope of precedent-setting decisions from California appeals courts that will affect public employers, personnel compliance requirements, and risk management programs. 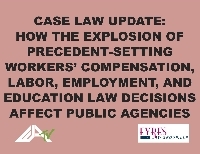 This webinar is fast-paced, informative review of the most critical case law from 2018 and anticipated decisions in early 2019. We will also introduce our new Stay out of Court Report, in quarterly format for 2018 decisions and re-formatted as a monthly Executive Summary for 2019 and beyond.